These words spoken in Russian are the very first expression of Easter joy we hear on Sunday, April 24, 2011 as folks gather at Birth of Christ Church in Kiev, Ukraine, preparing for the worship hour. Here is the choir after rehearsal preparing to ascend the steps to the sanctuary for the Easter service. 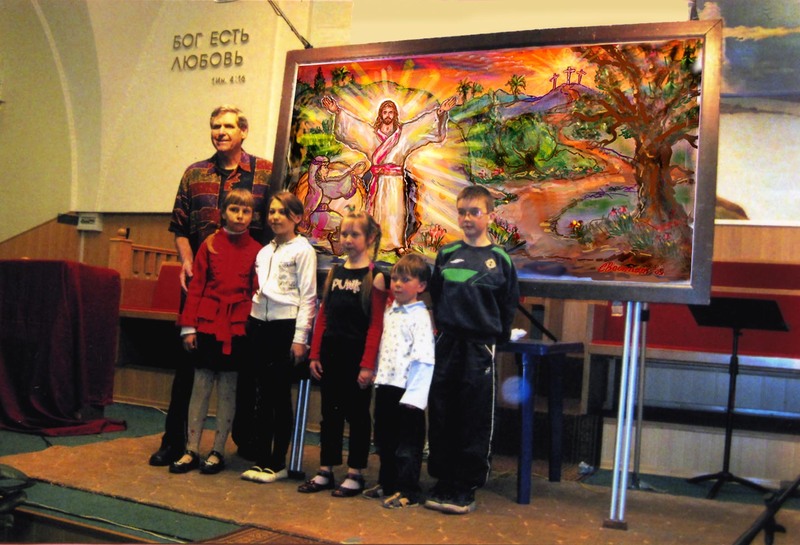 At the invitation of ABCLife, Kathy Gould’s ministry to children and families, husband Cliff and I spent two weeks in Kiev (April 8 – 28, 2011) and surrounding towns performing art and music shows in public schools and churches. His final program entitled “He is Risen” is presented here at Birth of Christ Church on Easter weekend. After the exchange of greetings, we worship by singing songs of the resurrection and then thrill to the experience of seeing the “He is risen!” presentation accompanied by exultant music and special lighting effects. 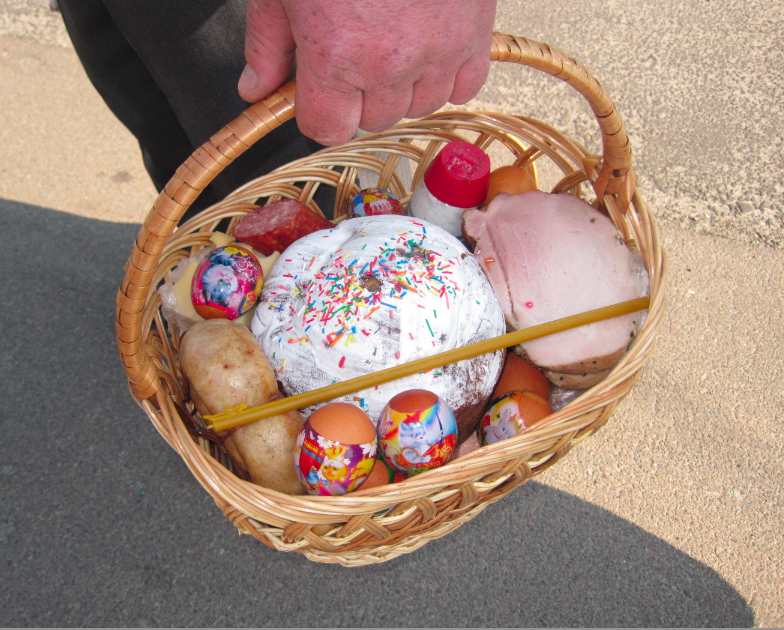 Before the service, early this Sunday morning, we see a couple, basket of Easter bread and eggs in hand, wending their way toward a Ukrainian Orthodox church farther down the road. Ukrainians walk every where possible as cars are very expensive here, and today the weather is cool and gorgeous. This couple graciously allow me to photograph their beautiful paschal offering. Their special bread is frosted and coated with sprinkles. 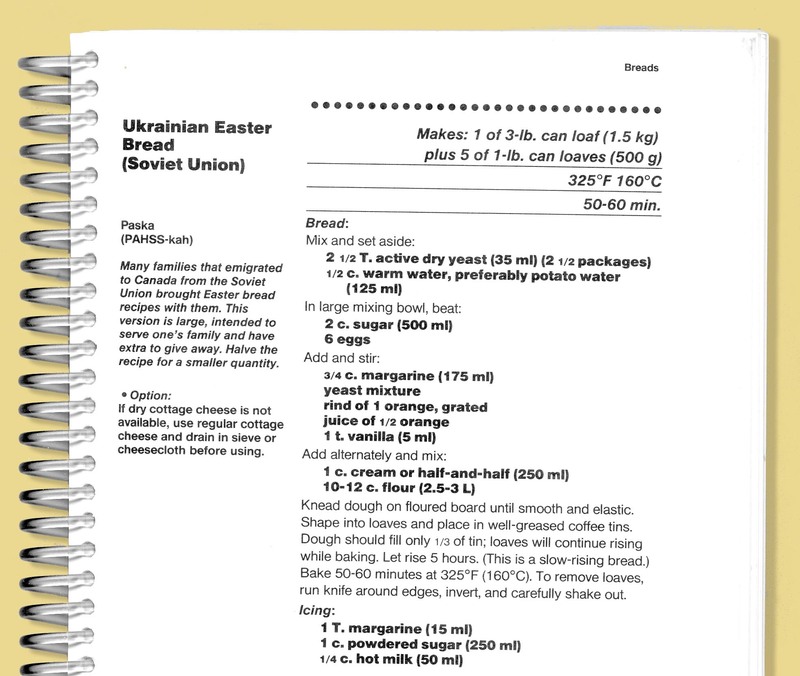 Here is a recipe for Ukrainian Easter Bread (Paska) from Extending the Table, a World Community Cookbook published by MennoMedia in a revised edition. In my older edition from 1991, the recipe is found on page 65. After completing 19 shows in a 12-day period, we are ready for a respite, which we enjoy in Crimea: the ornate Livadia Palace, site of the signing of the peace treaty between Roosevelt, Churchill, and Stalin; the Church of Foros with its onion domes, where celebrities marry. Then in a park in the city of Yalta, a statue of Pushkin, the celebrated Russian poet and one of Chekhov’s “Lady with Her Dog” virtually come to life along the promenade bordering the Black Sea. Sadly, the door is barred to Crimea now, once the accessible southern-most region of Ukraine. Since our visit, President Vladimir Putin has wrested this lovely coastal land from Ukrainian hands. Pray for the people of Ukraine! Good morning, Marian! It sounds like a lovely trip. I love those scarves (Robin\’s Egg blue? )–is the color significant? I know blue was considered the Virgin Mary\’s color. The situation in Ukraine is very sad. My grandparents came from there, but of course, with a totally different perspective, as they were the ones being persecuted. I hope all of your friends there are safe and well. Happy Easter to you and yours! Yes, Cliff and I partnered with Kathy four years ago to present this Easter show in churches and in schools: Choices (a drug education program) and The Earth, You and Me (about conserving our resources. Such a lovely post Marian thank you and I\’m so pleased I took 7.16 mins to watch! I thought I\’d save it for later but once I peeked… I so hope your other commentators look! (with choc Easter Egg in hand!) Please thank Cliff from me. I was in awe! My prayers for Ukraine are with them … and for all of this troubled world. Cliff has seen your comment and thanks you for sharing it. As you can see, he has many themes other than the one featured on this blog post and on YouTube. Happy Easter to you too! What a fascinating video. And you\’re married to this wonderful talent? I loved watching the video as he created and moved to the rhythm of the music. Interesting he wears those plastic gloves during the process. Thank you for heightening our awareness about Ukraine. My antennae will go up even higher when I listen to commentary. Our world becomes so much smaller when we make even one personal connection. Happy Easter to you and your family. The plastic gloves preserve what\’s left of the skin on his hands. After over 4800 performances over the years, very little is left of his epidermis. In fact, when Cliff was last finger-printed (security measure for school districts!) it was hard to get an impression. In fact, he often has to wear bandaids on his fingers especially in cold weather because he has rubbed off a lot of skin with the action of chalks on grey bogus paper. I will pass your appreciative comments on to Cliff. Easter greetings to you too! Such a LOVELY post! Thank you so much for sharing your experience. My uncle was recently in Kiev. Happy Easter to you and your family! Your writing invariably moves me! Thank you, Kathy from Ecuador. Comments like yours will keep me persevering for sure. Easter blessings to you too! How wonderful that you could be there for Easter. Wishing you and your family a wonderful Easter!! I will be with mine this year. Spain to Canada! I\’m sure you had many open arms on your arrival back to home base. Happy easter to the whole bunch! it was indeed special. So happy to spend time with mom especially. Of course seeing the kids and grandkids was great as well. Marian — Like Merril, I also wonder if the \”robin\’s egg blue\” scarves the choir members are wearing hold special meaning. What a lovely opportunity for you and Cliff. Having seen a video clip of him doing a live presentation, I can well imagine \”He is Risen\” was thrilling for everyone who was fortunate to attend. 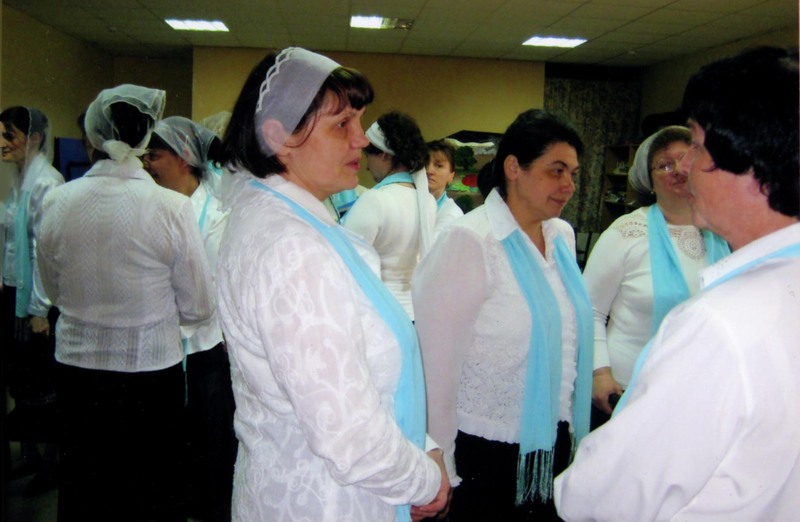 I will ask Olga about the significance of the robin-egg-blue in the choir scarves and report back here. Happy Easter to all at your house including Willa! Thank you, Marian. Blessings shared and blessings received, and as always a little history, too. Great photos and clips. Easter joy to you and yours tomorrow. Easter itself represents the contradicions of suffering and joy. Our connection to the people of Ukraine makes those emotions even more real this season. Thanks for your observations, as always, Elaine. I\’ve read about this wonderful celebration, and, now I\’m inspired to get a few more ingredients to make the Ukranian Bread that is also on p 65 of my Extending the Table. Thank you for the wonderful stories and photos. Blessings to you and your family this Holy Saturday. Dolores, though I\’ve heard of Holy Week, I don\’t think I\’ve ever heard of this day as Holy Saturday, but so it is – a day of waiting and hope. Do let us know how your Ukrainian bread turns out. Such an interesting post . I love to see they way other countries celebrate their traditions . Happy Easter to you and yours . Thank you, Cherry! Like you, I was pleased to experience another culture\’s \”take\” on traditional Easter celebration. Thanks for reading and faithfully commenting. Wow, I admire mission workers of any type who adopt a new country for their own and plan to live our their life there (I know another woman like that in Nepal.) Bless Kathy and her work and I think it is neat how you can take a trip from a couple years ago and use it to inspire others this Easter season. Looks like your husband\’s art has carried you both to some interesting places. God bless! Cliff\’s programs were done gratis of course, but the SkyMiles from this trip and many other previous American Art Assemblies\’ excursions to and from home base have funded our travel, sometimes just for fun. What a fascinating trip! It is such a shame to see what is happening over there now. You are right about the oppression of the Ukrainian people right now. Before our arrival four years ago, Cliff\’s chalks and metal, portal easel were shipped via The Black Sea to Kiev. Because Crimea is under Russian control, such a trip would probably no longer be a possibility right now.